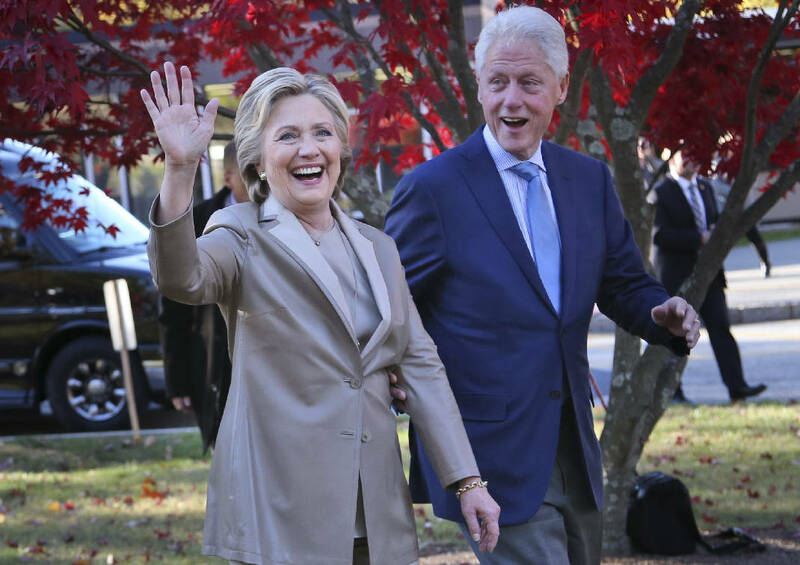 Democratic presidential candidate Hillary Clinton, and her husband former President Bill Clinton, greet supporters after voting in Chappaqua, N.Y., Tuesday, Nov. 8, 2016. NEW YORK — As the night wore on and things looked progressively worse for Hillary Clinton, her aides stopped taking calls or answering text messages. Ordinarily they would have been busy offering their spin to reporters, but as the presidential race slipped away from her and toward Republican Donald Trump, they went dark. When finally a call went out from the Clinton camp, it was from the Democratic candidate herself to the New York businessman, who claimed the presidency in a stunning outcome fueled by disaffected white, working-class voters who saw Clinton as an embodiment of the political establishment they disdain. Among the thousands of Clinton supporters who had gathered outside New York's Jacob K. Javits Convention Center, the intended site of her election night party, enthusiasm turned to despair. Some stared quietly at the election maps and data on their smartphones. Others cried as they filtered out of the convention center. By the time Clinton campaign chairman John Podesta spoke in the early hours of Wednesday morning, there were only about 150 Clinton supporters were left in the huge outdoor pens that once held thousands of people expecting to see the first woman elected president. Custodians began sweeping up. Podesta said the Democratic nominee would not speak. "My disappointment makes me not trust the rest of the world," said Katie Fahey, who had flown to New York from Grand Rapids, Michigan, wearing a red pantsuit, expecting a victory party. "I don't even want to go out. I want to wear sweatpants and curl myself up in a corner." As the night wore on, the shape of the contest was startling to Clinton and her aides, who ended their campaign exuding confidence. Clinton, her family and close aides were hunkered down to watch returns at a Manhattan hotel suite. Her supporters became increasingly despondent as they watched key swing states Ohio, Pennsylvania, North Carolina and Florida go for Trump on Tuesday night. Then Pennsylvania and Wisconsin — both reliably Democratic states — also went to Trump, and The Associated Press called the race for Trump around 2:30 a.m. EST. "I'm terrified," said Niki Rarig, 34, who traveled to New York City from Portland, Oregon, for what they thought would be a victory celebration. "I just can't even imagine what a Trump presidency would look like." Earlier in the day, Clinton voted at an elementary school near her suburban New York home with her husband, ex- President Bill Clinton. She spent Tuesday afternoon and in a Manhattan hotel suite, watching, waiting, and playing with her grandchildren. Her dark Election Day was a stark contrast from Clinton's confident final days on the campaign trail. The former secretary of state and New York senator dashed through battleground states, encouraged get-out-the-vote efforts and campaigned with a star-studded cast of celebrities. The eve of the election included appearances with President Barack Obama and first lady Michelle Obama, Jon Bon Jovi, Bruce Springsteen and Lady Gaga. Some good news boosted Clinton's spirits in the final moments of the campaign. On Sunday, FBI Director James Comey sent a letter to Congress, informing lawmakers the bureau had found no evidence in its hurried review of newly discovered emails to warrant criminal charges against Clinton. The late October announcement of a fresh email review rocked the race just as Clinton appeared to be pulling away from Trump in several battleground states. The update from the FBI may have come too late: In the nine days between Comey's initial statement until his "all clear" announcement on Sunday, nearly 24 million people cast early ballots. That's about 18 percent of the expected total votes for president.